For many nonprofits, two initiatives go hand-in-hand: increasing donations and raising community awareness. Thanks to technology, rising use of social media, and online giving, meeting both goals has never been more attainable. Through peer-to-peer and socially-focused fundraising, nonprofits are having success launching virtual and awareness campaigns (i.e., fundraising without a physical event). 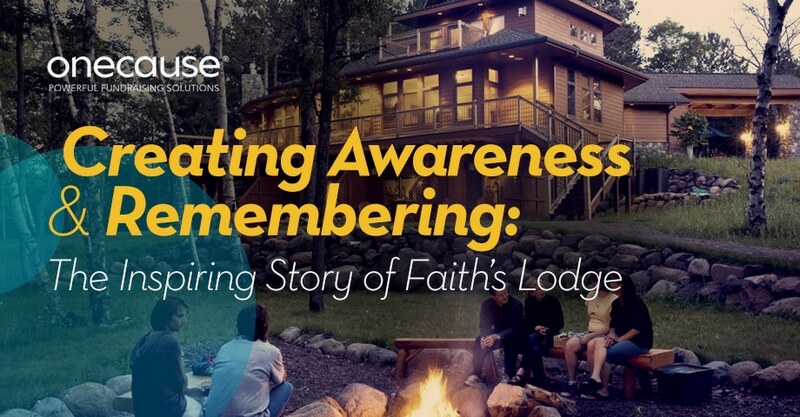 For Faith’s Lodge, coupling an awareness month, with an effective social strategy, and peer-to-peer fundraising campaign was a huge catalyst for success. The month of October is Child Loss Awareness Month, and it holds a special place in the hearts of the team behind Faith’s Lodge. After their newborn daughter Faith was tragically stillborn 18 years ago, Mark and Susan Lacek founded Faith’s Lodge. They wanted to help other parents and families who face loss, escape to a peaceful place, renew their strength and build hope for the future. The “lodge” tucked away in the woods of Wisconsin, includes eight guest suites designed to provide privacy and a safe haven for grieving families. Since opening in July 2007, Faith’s Lodge has served over 8,000 people. As the only facility of its kind in the country, Faith’s Lodge was recognized on the TODAY Show as a national leader in healing retreats. The challenge was how do you spread awareness in one month and raise funds for such a deeply personal cause? Enter a peer-to-peer virtual awareness campaign that helped give families a platform for remembering those not forgotten. Because the campaign had a strict timeline (the month of October), the timing had to be planned down to a tee. The Faith’s Lodge team turned to OneCause and its Peer-to-Peer platform to deliver a seamless donor experience and amplify their reach in a short amount of time. The team launched the ‘Say Their Name Challenge’ campaign on October 1st, which gave people an online platform to share and honor the names of their children who passed. Donors participated from anywhere, at any time. They used the built-in social integration to create a name wall that honored each child, and a #SayTheirNameChallenge hashtag that spread the message far and wide. Supporters also shared pictures in a real-time photo gallery, making the campaign personal and powerful. What happened next was profound. The campaign spread on social and in news coverage, those who lost children or were close to the families who did, remembered each child. The social aspects of the #SayTheirNameChallenge even encouraged returning donors to step up their efforts. One donor in particular who gives annually decided to give outside her normal donation thanks to the match feature on the campaign’s online site. For more information on Faith’s Lodge or to support their mission visit www.faithslodge.org.